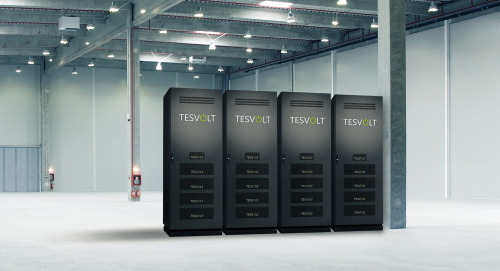 According to Tesvolt, the storage system can complete around 6,000 full charge cycles with a depth of discharge (DoD) of 100%, which means that the entire battery capacity can be used. The storage system functions with a low voltage of 48 volts as well as with a high voltage of 1,000 volts for stationary commercial and industrial applications. Simon Schandert, Director of Engineering at Tesvolt says the battery contains Samsung SDI’s new prismatic lithium cells, which BMW recently introduced into its electric cars. Alongside BMW, other automotive manufacturers are focusing on prismatic lithium cells, due to their potential to expand the range of electric cars. “We are combining the new cells with the Active BAT Optimizer – our special battery management system – to ensure active cell balancing between all cells, even between the different battery modules. This allows us to achieve battery system efficiency of 98%, and a lifespan of around 30 years”, adds Schandert. Tesvolt says the Samsung SDI cells are fire proof, with no danger of explosion. Tesvolt’s system also monitors the state of each individual cell to prevent damage at an early stage. Battery modules can be exchanged at any point, and the storage capacity can also be expanded.